Parties are rarely rated with the term "legendary"; more often than not the host will have to pull off something extraordinary to excite the guests into such a fever that they will be talking about that fabled night for weeks to come! 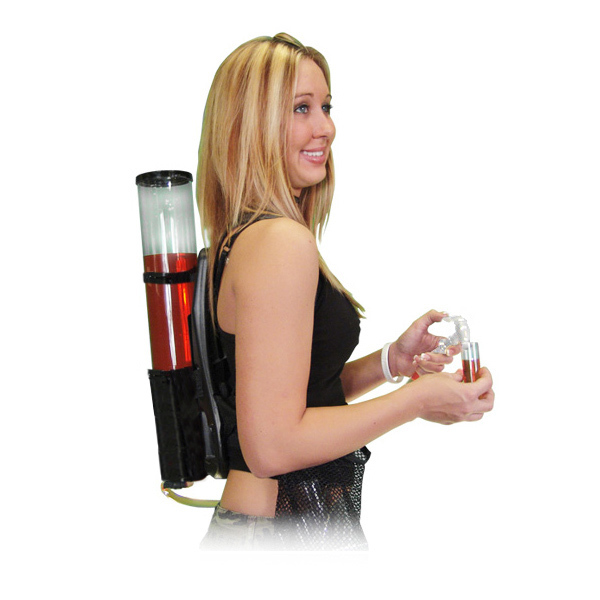 If you're looking to host a party or event that will imprint itself in the memories of your guests, then the Backpack Drinks Dispenser is certain to be the ideal drink accessory to keep people happy throughout the night! This most excellent drink dispenser has taken the classic Beer Tower design and has ingeniously turned it into a portable, wearable piece of smile inducing drinkware! 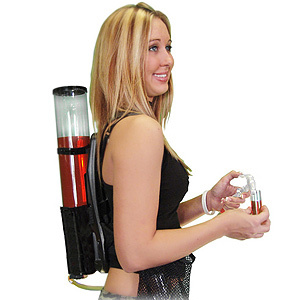 Simply fill this giant 3ltr tube with your favourite beverage, strap it to your back and be the most popular person at the party as you serve drinks with ease! With an ergonomic design, this backpack might not be able to hold all your camping equipment, but it can hold up to 3 litres of your favourite beverage! Simply use the attached tap to dispense your stored liquid, and use the net holster to store all your glasses for easy and quick serving! "Great product, very well made except for the lid. Not very tight fitting or secure. Not that it was a problem... but would be better if lid was a tighter fit." "Bought this for an event I was running a while back. Was a bit dubious of its quality due to the low price but worked perfect with soft drink and it went down really well with my guests!" "Great Product, very quick delivery. Spot on! Oh and Back pack is great for festivals!" "We got this for a big brand drinks promotion at events, it dispenses easily, feels comfy and holds enough liquid so we don't have to do refills every 5 mins! Def recommend for events and festivals (or a massive party!)"